I remember the day as if it were yesterday. I was in a grocery store in California when I saw there were cheese samples. Without thinking I popped the unevenly cut, amber colored cheese into my mouth. I didn’t know what it was but I knew I wanted more. I looked up at the man behind the counter, wide-eyed and asked “What is this? !” He laughed and pointed at the sign 8 inches from my face. “Five- Year Aged Gouda imported from The Netherlands” was scribbled neatly onto a card. Without asking, I grabbed another sample. The man asked me if I wanted to buy some to which I nodded furiously. Once I had swallowed, I begged him to sell me the entire wheel. I needed this cheese and I needed all of it. I imagined a life where my entire house would be made out of this cheese and I would die from a Gouda overdose. Death had never sounded so delicious. Hold the crackers because this is a cheese that truly shines when served alone- aside from a wonderful glass of red wine. The natural rind that forms during the aging process is inedible so remember to cut that off before you’ve eaten the entire wheel. The flavor is sweet and salty and is sometimes referred to as cheese candy due to its slight caramel taste. Calcium lactate crystals (crystal lactic acid) form while the cheese is aging which gives this Gouda a heavenly crunch. The texture is similar to Parmigiano-Reggiano, firm and flaky. After moving back to Boulder, I frantically searched everywhere so I could get my hands on some Gouda. On occasion I was able to find it in Whole Foods but for the most part, my relationship with Gouda began to waver. My luck eventually changed though. While browsing at the grand opening of Alfalfas, I found myself in the cheese section. I was always looking for new cheeses to try so I quickly skimmed the selection when I came to a dead stop. There it was, wrapped neatly in plastic and labeled in bold type, my five-year aged Gouda. My heart nearly stopped as I went into my happy dance. I managed to compose myself once an employee came over to ask if everything was okay. I laughed and pointed to the cheese, explaining that it was my favorite and I had to buy some. I was ecstatic; Gouda was back in my life. Shortly after, all of my dreams came true; a cheese store was set to open on Pearl Street that August. I waited impatiently until opening day arrived. As I stepped into what I can only describe as my heaven, I had one mission: find five year aged Gouda. 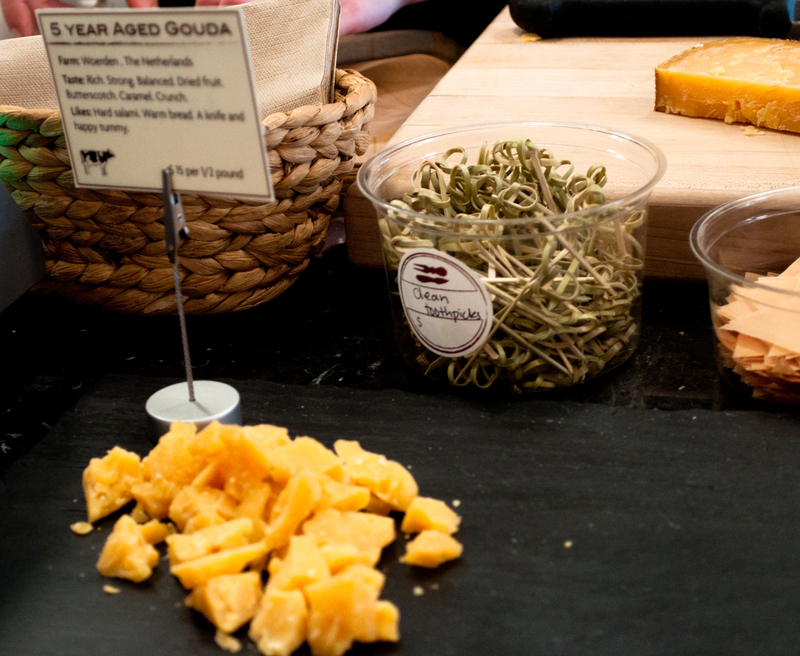 Sitting on the counter next to a few samples was an entire wheel of five-year aged Gouda. I repeated the same happy dance that I had done in Alfalfas not so long ago as they wrapped up a slice, labeled it and sent me on my way with a smile. Five Year Aged Gouda samples at Cured. Can I sample it more than once? For three years I got away being one of the few to know about this heavenly creation. However, people are wising up in the world of cheese and starting to explore more than Brie and Cheddar. In the last month, more people have been talking to me about five-year aged Gouda than in my entire life, which is giving me mixed emotions. I am thrilled that everyone finally understands what I’m talking about when I mention “Gouda withdrawals” but I am a little upset because these people are going to be taking my treasure from me. Once this stuff landed on my tongue, no other Gouda would do (not that I’d EVER turn down any kind of cheese). Fortunately for me and the entire city of Boulder, this cheese is a lot easier to find than it used to be. It seems to have become a staple in many cheese carrying grocery stores around Boulder and I’ve noticed Whole Foods has it in stock much more often than they used to. I’d be mortified if I sent you to your grocery store only for you to come home Gouda-less so I’ll give you a few recommendations. The owners of Cured, Will and Coral, are smart enough to carry this gem at their shop. They’ll even be able to recommend a delicious red wine to go with it. I’ve also purchased it in the cheese section at Whole Foods and Alfalfas. Many times, these are pre-wrapped but don’t worry, they give you a substantial quantity. Next Next post: Nourish Yourself!